I hope this piece by my terrific intern, Nicole Ratner, inspires you to find a form of exercise you enjoy! Exercise plays a vital role in a person’s life for many different reasons. Regular physical activity can help reduce the risk for type 2 diabetes, obesity, depression, and certain forms of cancers. Plus, it can provide a mood boost and help with weight management. Whether you love to work out (or not so much) find an activity you enjoy (emphasis on enjoy). It can be walking to work, going for a bike ride, or playing tennis with a friend—anything to get those competitive juices flowing. While I sometimes like to go to the gym on my own, my favorite workouts are exercise classes. I’ve tried a few different varieties and I’ve happily found a rhythm that works for me. As you’ll see, I’ve recently explored a few different classes and am always looking for new ways to challenge myself. I hope my routine inspires you to find a workout you can enjoy as well. 1. Spinning: After hearing all the hype, I just had to try it. And yes, I did fall deeply in love. What attracts me the most is not the high intensity of the workout and the speed of the ride, but the instructors’ love for the class. They set up amazing choreography that fits the music, creating “dance” moves on the bike. 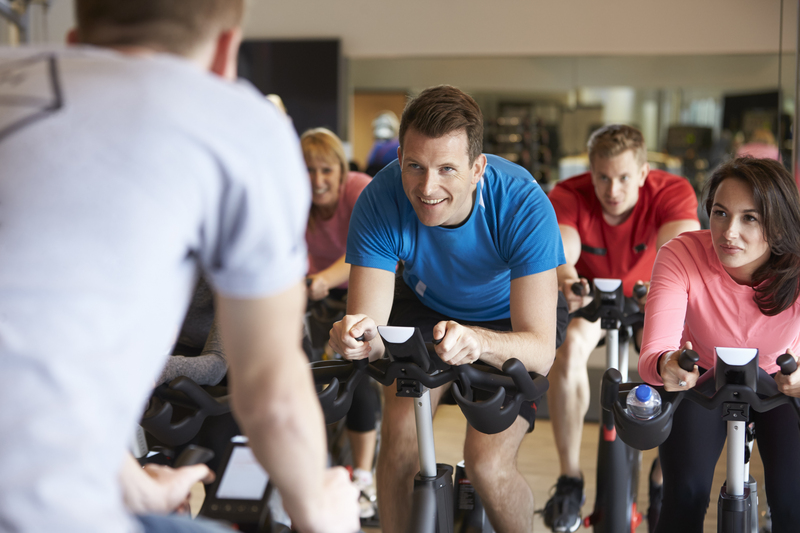 With the addition of push-ups, tap-backs, crunches, running, and slowly pushing on the bikes, the instructors create a rhythmic workout that’s fun and definitely sweat-producing. The instructor’s passion radiates in the class and their motivational words to “push harder” makes you determined to reach your goal. Ending with weight lifting, this 45-minute spin class is not just an amazing workout, but a fun time—a hard duo to find. 2. Orange Theory: These HIIT (high intensity interval training) classes squeeze cardio and strength training into a short amount of time. When taken in a group setting, a coach instructs you to run up a hill on the treadmill and guides you through the workouts. The cardio section also includes a little bit of rowing, where you follow a board that tells you the pace to row in between treadmill segments. The fast moving class has a competitive nature; each person wears a rate monitor, and there’s a screen that shares your pace and progress. I would definitely recommend it for a great high intensity workout to get your heart pumping! 3. Kickboxing: This workout class is next on my “gotta try” list This adrenaline-flowing workout focuses on every part of your body. And, it can help you learn some self defense techniques, too. Combining cardio and strength training, the workout is a fun way to enhance your cardiovascular fitness and tone your body at the same time. It also seems like a great opportunity to release some built up aggression!